"The Lord Jesus Christ is sitting upon the throne of David and ruling over the Church as the Son of David. 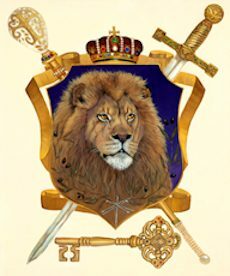 Here, the teaching is that David (Jesus) is already ruling through his Church, and has therefore given them (well, at least the apostles and prophets and gatekeepers) the keys of David to open and shut, that is, executive power to rule in the kingdom, including keeping out anyone they believe is a danger to their system. But the Bible says that the key of David is DAVID’S KEY! And who is this “David?” Of course he is the Lord, the Messiah, who has come in the line of David, as David’s heir, to inherit the throne of David and become in the course of time the KING of all the earth as well as HEAD of the Church. The “key” means the power and authority and government of the kingdom. This belongs to Jesus Christ not to the Church! Has God said that the world will be governed by members of his Church? "And I will set up one shepherd over them, and he shall feed them, even my servant David; he shall feed them, and he shall be their shepherd. And I the LORD will be their God, and my servant David a prince among them; I the LORD have spoken it. And David my servant shall be king over them; and they all shall have one shepherd: they shall also walk in my judgments, and observe my statutes, and do them." And when will this ONE "king David" rule over us? At the same time that He comes to take his throne, the Throne of David - during the millennium. NOT today, and NOT in the present apostolic/prophetic churches! This verse has become controversial because it produced the idea of Papal Authority, and the power of the confessional. The Catholic Encyclopedia says this: "The expression "power of the keys" is derived from the words of Christ in Matthew 16:19... Christ by employing this expression clearly designed to signify his intention to confer on St. Peter the supreme authority over His Church. ... Almost invariably the words of Christ are cited [in early literature] in proof of the Church's power to forgive sins." Roman Catholics interpret this verse a number of ways, but possessing the keys of the kingdom meant to them the power to open or shut the doors of eternal life; and no-one could therefore be saved outside of the Roman Catholic communion. It’s striking, therefore, to see this teaching transplanted into the Protestant churches under the guide of gatekeeper authority! Matt 18:1-18 At the same time came the disciples unto Jesus…, (verse 18) Verily I say unto you, Whatsoever ye shall bind on earth shall be bound in heaven: and whatsoever ye shall loose on earth shall be loosed in heaven. There has been much speculation about these issues and this is not the place to discuss what binding and loosing means, but just to say that “keys” clearly refer to one central item that has the power to open up and give entry into, in this case, the kingdom of God. That central truth – the "key of knowledge" that the Jews sought after and failed to find (see Luke 11:52) – is the fact that salvation and entrance into the kingdom of God is BY FAITH, and ONLY through and in Jesus Christ. All who know this truth have the key to admit others into the kingdom because they pass on this truth in the power and authority of the Holy Spirit. It’s as simple as that! ALL truly born-again Christians therefore have the “keys of the kingdom” and authority under Jesus to use them. There is no esoteric mystery about these keys that only some exclusive endtimes group of anointed gatekeepers may attain! The Vatican crest and flag shows Peter’s keys, and the keys have become synonymous with Catholicism. Even those who know nothing about Christianity believe that St. Peter stands at the Gate of Heaven with his keys, to admit “good people”. But this mythology is a throw-back to pagan ideas where the gates of the underworld were guarded by dragons, spirit-guardians or gods who weighed the souls and lives of entrants before making a decision whether or not to allow them to pass. The idea of gatekeepers is as old as religion itself. Janus was the Roman god of portals, spiritual dimensions, and new beginnings, and it's instructive to consider his role as a Gatekeeper in this day and age, when we are informed that the Church itself has come to the threshold of a New Beginning, and is about to pass through the veil into a higher spiritual dimension. Let's now tie this in to Christian use of gateways and keys. Is there a similar meaning? YES. For we are told that the Church is at the doorway to a New Beginning; we are now in TRANSITION from one era to another, from the second to the third day, from a word-based dispensation to a spirit-based dispensation, from a soul-era to a spirit-era, and from the Holy Place of service into the Holy of Holies of "intimacy" and "mystical marriage" where God inhabits his people as the Shekinah of the Restored Temple. Comparing the role of Janus, the god of gateways, with the role of apostles and prophets in this church that is passing from "one condition to another" we could be forgiven for identifying many similarities. Furthermore, the transition from soul to spirit is often spoken of in the modern Church as the "manifestation of the sons of God", the elevation of many sons to "glory" and to a new spiritual dimension. The process we are supposed to believe is now taking place, for any who are willing to accept it, is that of personal transformation, fulness, attaining to the adoption as sons of God - but only for those few who are spiritually able to reach this goal. What has this to do with Janus and gates? The gateway (one that the Church seeks to open for themselves and close to those they consider unworthy) is that of passing beyond the veil of the New Temple, into a higher spiritual state. "We come this day with a very important message carried to you on the wings of the servants of God, the Angels. THE OPENING OF THE DOORWAYS: Today marks the beginning of a new era for Humanity ... To those of you who have waited for so long to see the changes with your human eyes, you will begin to look around and see the entrance of a new level of awareness as well as its expression taking form in this world. THE USE OF THE DOORWAYS: We will try to give you a picture to work with here to assist you in practicing to use the doorways....the doorways to the Higher Realms. THE TRIBULATION: It will not be an easy time for those of you who have chosen to walk the Path in this epoch. It will seem as if there is nothing left to call familiar. Ride out this time and you will be greatly rewarded. ... You are now dealing with the last vestiges of ego as you know it. This is necessary for you to be clear as tool of enlightenment. Come together with others during these times to be of support to each other. If there ever was a time to extend your Heart and hand to your Brother, it is now. This is a group activity make it so through your actions to others. The day of what you view as a personal path is over. There is but One Path, the Path of Unity to one end - the Awakening and joining together of the Sons of God, as you are known by many. There will be many who will appear to fall away in these times. There is also a well-established mythology about spiritual “portals” guarded by demons, monsters or gods through which aspirants travel to higher spiritual levels. The mythological “keeper of the treasure” or Guardian is in fact preserving the Hidden Wisdom of the ancients from the prying eyes of ordinary folks and the guardian at the gate often requires seekers to undergo some kind of purification, test or spiritual strategy to prove his or her readiness for the journey beyond. Much of the teaching on keys, gates and gatekeepers is drawn from an allegorical interpretation of Old Testament prophecies and scriptures. One set of scriptures that dominates the revival scene is David’s Tabernacle. “On the third of January 1998, John Painter sent a scripture study of his over the Internet which confirmed for me that it is time for me to speak about the prophetic intercessor of the end-time church. His study was also about the Tabernacle of David being a 'type' for the end-time church, and about a transition between two tabernacles, the Tabernacle of Moses and the Tabernacle of David. So we see that the Gatekeepers are in fact ministers in a Restored Church of the Endtimes, (the only gathering place that will be protected and blessed by God, supposedly) and these ministers are a replacement for those in the present denominations, ministers who are labeled by the New Order churches as rebellious, religious, jezebels without the power or presence of God. in Jesus Christ, restored to glory in HIM. But as always, present truths are relegated to mere hopes and wishes by the sonship/New Order teachings. Truths such as the spiritual unity of all believers, our glorious inheritance, the fullness of the Spirit, and now the restoration of the Tabernacle are supposedly out of our reach, only achievable by a small elite group of overcomers who attain spiritual holiness and superabundant power in the endtimes! Despite all this, and despite the fact that all born-again believers already belong to the Tabernacle of David and are safe in the Lord, “David’s Tabernacle” is said by some to be a restored Church of the endtimes, rebuilt progressively in the 20th century and consisting only of Charismatic Christians who subscribe to the revivalist teachings! It is taught that this renewed Tabernacle of the lastdays Church has moved to a new spiritual level represented by the “Holy Place” and therefore has received priestly authority to GOVERN the Church and mankind. This Holy Place is of course the 2nd chamber of the Tabernacle; a place of ministry and service. And it is the 3rd chamber into which the Church is supposed to be moving, the Holy of Holies where the Glory of the Presence of God abides! Now, think about this. What, in the Tabernacle, stood between the Holy Place and the Holy of Holies where God dwelt in the Glory Cloud? Yes, it was a veil, a portal through which only the anointed High Priest could enter. So we see yet another allegory that is being used, relating to the gatekeepers. The “gates” are seen as a spiritual portal or veil separating the present-day church from its spiritual inheritance, dwelling with God in the Ark of his Presence. The gates represent a passage into the Glory! It is the role of the gatekeepers to open up those gates, not only to allow authorised entrants into the Glory, but to keep all others OUT. No Christians of traditional denominations, or who reject revivalist New Order doctrines will be admitted to this endtimes restored Tabernacle. And how will this ruling be carried out? Why, there will be men and women standing at the doors to make sure of it! “…Says the LORD of hosts. The stop gate [in a dream of Laura Burns, Bill Burns’s daughter] represents the power of opening and shutting by the authority of the Lord. The three guards represent those gatekeepers that will become manifest in the third day of power that we are now entering into, which will also be a day of judgment. We must now pay attention to the Wind (voice of the Spirit) so that our timing is correct if we are to be found in safe habitations in the coming days, and we must follow the directions of the gatekeepers so harm will not come to us as divine judgment comes to the earth. Bill Burns sees latter-day Gatekeepers of a Restored Temple, whose job it is to herd all the approved sheep into the safety of the fold, while outside their camp the judgement of the Lord falls on all those who are not permitted to enter. The Gatekeepers have spiritual authority, we are told, to admit some privileged saints into the kingdom and keep all others outside where they are doomed to the wrath of God. Some who do not fit into the correct mould are excluded from this place of safety, and the gates are closed against them – not by God, but by men and women who see themselves as Gatekeepers of God’s Kingdom! I’d like you to notice that the coming of the Lord is described in terms of an outpouring from above, a FLOOD; and this outpouring will require all those who seek safety to enter the Ark, here described as “The Ark of My Presence”. Even believers (to whom this prophecy was addressed) are called to “repent” and to seek to enter this mythical Ark as if they were not already in Jesus Christ, their Saviour! So the GLORY (a spiritual outpouring – please see my series of articles on the overshadowing for more information on this doctrine) represents both judgement on the rebellious and safety for the faithful – that is, those who receive this spiritual overshadowing and submit to its powers. Furthermore, the Gatekeepers are now being given authority in the spirit realm to both open the gates to release this spiritual flood, AND to deny access, to “close the gates” against any they believe are not fit to receive it. Can I be the only one who feels a deep sense of foreboding when I read this prophecy? As I have pointed out elsewhere, not only some Christians today but New-Agers and occultists are expecting an “overshadowing” to take place that will raise some willing souls into a new spiritual plane, and leave the rest of mankind behind, facing in some cases a terrible cleansing action that will purge them, like germs, from the face of Mother Earth. This outpouring “of love” is not the love of God that convicts of sin and gently urges to salvation in Jesus. It is a FEELING (New-Agers call it “goodwill”) that comes upon the mind and heart, the emotions and thinking processes of men and women who desire to be changed but have rejected the only method of change available in God, that of receiving the new nature bought and paid for at the cross. "I love that miracle anointing. I promise there is great grace rolling into this room. It can only come if His Presence is manifested. It is the sufficiency of His grace. His grace is that which is sufficient. I can feel the virtue of God being loosed, going out of me, into you. Please stand to your feet. I want you all to receive it because it will stain [sustain??] you…I release great power, and in the name of Jesus, great grace! It’s coming in another wave, stand and just take it, receive it. It’s His love, His manifested Presence, it is who He Is. …The Presence of God is getting heavier and heavier in this room. He is here! His Presence is here." This “tidal wave of love” will indeed (if you permit it) “permeate you to do the bidding of the king”, the lord of the earth when he comes to enslave mankind to his anti-christ will. But not only is this overshadowing being eagerly sought and called down by Christians today in a misguided attempt to “bring in the kingdom” but it’s being represented as THE ONLY PLACE OF SAFETY for mankind. Men and women are being appointed and set apart to usher all who are willing into this place of false love, the supposed “glory cloud” and to exclude all others, to curse them to everlasting damnation. Naturally, anyone reading this who knows the Lord and believes in biblical salvation will have no fear that a bunch of deluded revivalists can do anything to remove their assurance of eternal life, nor exclude them from the blessings that they have, in fact, already received. Praise God for that! No, there is no danger for genuine believers except from the pressure to conform to this madness. (And perhaps that pressure will be very intense and subtle?) But for all those who are minded to follow false teachings and submit to the apostate church, there are pitfalls like never before, one of them being the urge from their leadership to seek, pray for and submit to this spiritual force they call the “glory”.